The Curtis Model 1313 Handheld Programmer is a powerful and intuitive programming and diagnostic tool. Model 1313 enables parameter files to be created and edited online or offline, transferred to another controller for cloning, or saved onto a PC or SD card. The Model 1313 performs comprehensive programming and troubleshooting tasks for all vehicles that use Curtis programmable motor controllers or control systems. The Curtis Model 1314 PC Programming Station simplifies programming, testing and diagnosing Curtis speed controllers and auxiliary devices and provides database and tracking features. 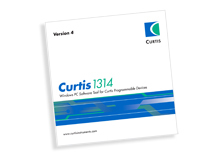 The Curtis Model 1314 PC Programming Station provides a powerful Windows interface for adjusting the settings, troubleshooting and recording the parameters of any Curtis product with a serial or CAN bus interface. Model 1314 works with all microprocessor-based Curtis controllers and chargers. It is the ideal companion to the Model 1311 Handheld Programmer for the OEM manufacturing site, dealer service centers and the more advanced users.